Winter Belly Dance Classes with Rosa Noreen! Discount: Save $10 if you sign up by December 11! Save $10 when you sign up by December 21! 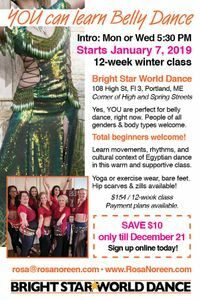 Lean movements, rhythms, and cultural context of Egyptian style belly dance dance in a friendly and supportive environment during this 12-week class for total beginners. YOU are perfect for belly dance, right now. You don't need to lose weight or be flexible. You just need to be ready to have fun learn something new! People of all genders, backgrounds, and body types are welcome, ages 14+. Yoga/exercise wear, bare feet. Jingly hip scarves and finger cymbals available to borrow or buy at class. Reserve your spot today at rosanoreen.com !